Pinterest board. There are a few novelty items added too, for good measure! I love that so many of these can be found on the high street too Christmas shopping for loved ones turns in to shopping for oneself again! 1. Accessorize colour block bag - this comes in two different colour palettes but I think the pink and grey is so dreamy. I saw this in store a few months back and couldn't stop swooning over it... you know when there's an item so special it takes over the whole shop, in your eyes anyway. I think I stared at it for about 10 minutes before deciding I couldn't meet the price tag. This baby is at the top of my Christmas list this year. 2. EH-XC10 Facial Cleansing brush - I feel like I've made some impressive advances in the skincare department this year, finding a cleanser that doesn't irritate my skin, there is hope! This 3 in 1 cleansing brush is stunning, it's so aesthetically pleasing, has so many great features including a pore focus brush attachment, plus is easy to use and is said to be 18 times more effective than washing by hand. It's got some great reviews too and is definitely something I'm interested in investing in this winter. It would make such a great gift for your best friend or any skincare enthusiast in your family, it's sure to be greeted with 'ooohs' and 'ahhhs'. 3. Miss Selfridges blush faux fur dolly coat - Just when you think you've found the coat of dreams, another one appears. I have to give credit to the wonderful Catherine for finding this beauty! I adore it but can't justify buying another coat for myself; it would make such a beautiful gift for any pink lover out there. 4. Betsy Benn Cygnus Swan ornament - Such a beautiful ornament, not long ago I was kindly gifted one and was blown away with the quality and how stunning they are, this swan would make such a special keepsake. 5. Yankee Candle Spiced White Cocoa large jar - Somehow I ended up smashing my beloved Spiced White cocoa small jar, I was gutted but happy that I can still light it and it still smells amazing. I would love to get a large jar as this has to be one of my favourite Yankee scents of all time, it literally smells like a hot chocolate or latte on a frosty morning, you can almost detect the cream! Foodie scent lovers will adore this. 6. Victoria's Secret Wicked Unlined Uplift bra - When you find things are even more beautiful in person... it's so sparkly and ethereal and such a perfect range for the holidays. I need to buy so I can wear it over my clothes. 7. Pandora Disney Mrs Potts charm - The Disney Pandora charms are so magical, the stuff of fairytales! There are so many to choose from and they are certain to steal your loved one's heart. My favourite is Mrs Potts! 10. Ban.do mini grid tumbler - I find this such a cute gift idea, it is practical as well as looking adorable! ooo these all look way fun!! thank you for sharing!! Everything on this list is so cute and girlie. 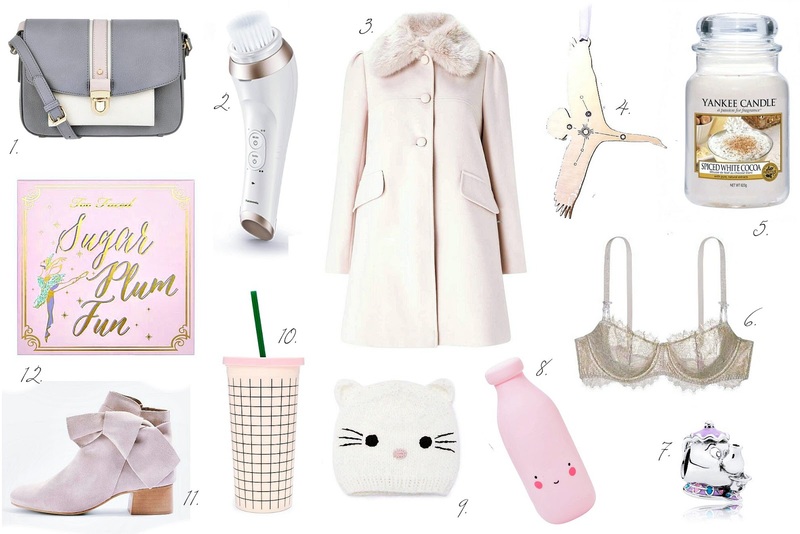 Such a great list - that coat!! Great picks. Love those shoes! I love the kitty hat! I wish it was black though.. but it's still super cute. I love Yankee Candles, I feel like they are always on my Christmas list! Thanks for the ideas, great post. With Christmas presents this year, I'm on a much smaller budget so most things on this list are kind of out of my price range (XD). Nonetheless,great gift ideas! The Topshop boots are super pretty! And so is the coat, these pastel/blush shades are lovely. It's great to start looking for gift ideas already, better to start early! Hi, I follow your Blog! Do you want to return the registration? (GFC) FOLLOWERS NUMBER 822- the gfc bar is on the right running a lot of the Blog page thank you I look forward to here: http://casaninnamamma.blogspot.it/2017/11/zaful-thanksgiving-shopping-tips.html thank you dear!